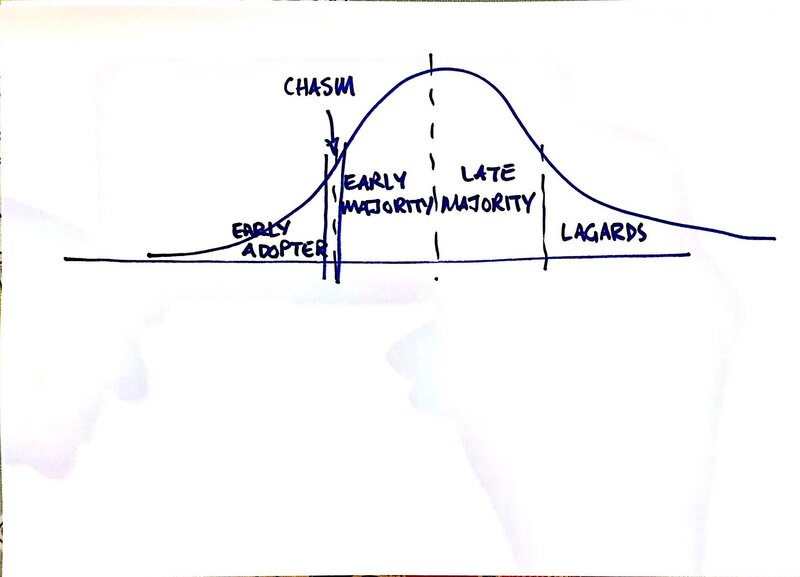 Between the “Early Adopters” and the “Early Majority” is the Eponymous Chasm that many great ideas have fallen into, never to be seen again. “Crossing the Chasm” is about getting an idea across that Chasm to the riches and success on the other side. 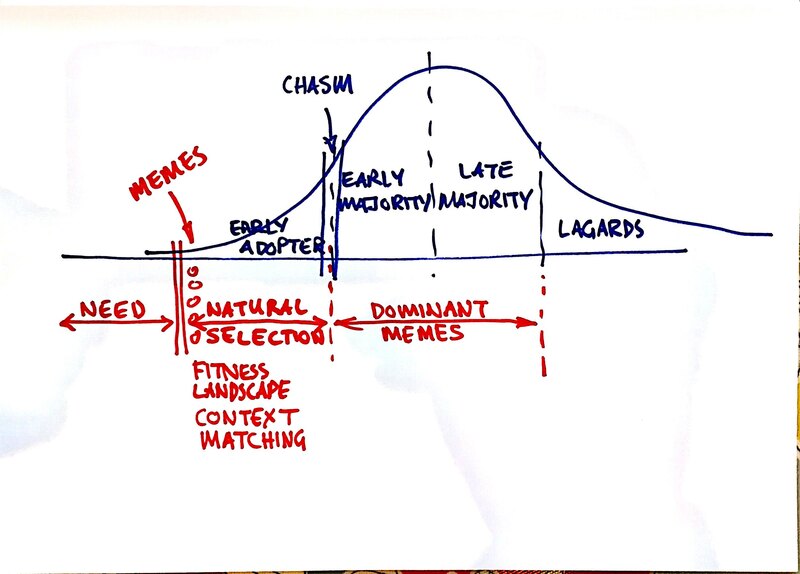 It has helped my understanding of this to overlay Julian Everett’s excellent work on “The Meme Lifecycle“. From Julian’s Meme Lifecycle, all meme come about as the result of a need. Before the meme or solution exists, there is simply a need*. There are often several independent groups or individuals working on solutions to the need which it is why there are often several independent and competing solutions that occur at the same time. Once a meme has come into existance, it goes though a period of evolution and natural selection. During this phase, the meme is tested in different contexts, or fitness landscapes. In each fitness landscape, the meme might take a different form or expression known as an extended phenotype. The key issue about this stage is that a great idea might fail because of the context, and as a result it will need to evolve to satisfy the needs of that context. As a meme approaches the chasm, the uncertainty about the contexts it will and will not work in is resolved. A necessary condition of a meme exiting the chasm is that there is certainty not only about the meme and how to use it, but also which contexts it will and will not work. People who claim that a meme fits all contexts and then modify it to fit a new context are preventing the meme from exiting the chasm. In my opinion, Scrum needed Kanban to leave the Chasm. In order to put work into Scrum, you have to be able to estimate it (or time-box it). This means for discovery (PM/UX) work, Kanban is a preferred mechanism. Scrum is only possible when the work is predictable for at least the next week or two. For highly unpredictable work, such as IT Operations or UAT, Kanban is preferred. Kanban works best when the person responsible for prioritisation (Product Owner) is highly available, preferably co-located. In situations where the prioritiser is not highly available, it preferable to batch requests using Scrum. So for an off-shore development team, the PO team might use Scrum to manage prioritisation. The development team might use Kanban inside the Scrum framework. Its is now known when to use both Scrum and Kanban most of the time. This makes them far more appealing to the risk averse who hate uncertainty. 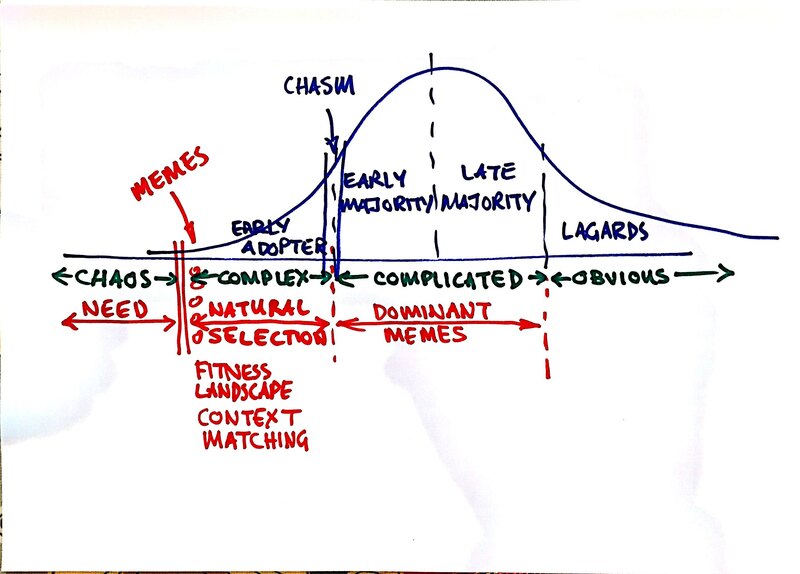 Cynefin maps nicely to the Meme Life cycle. 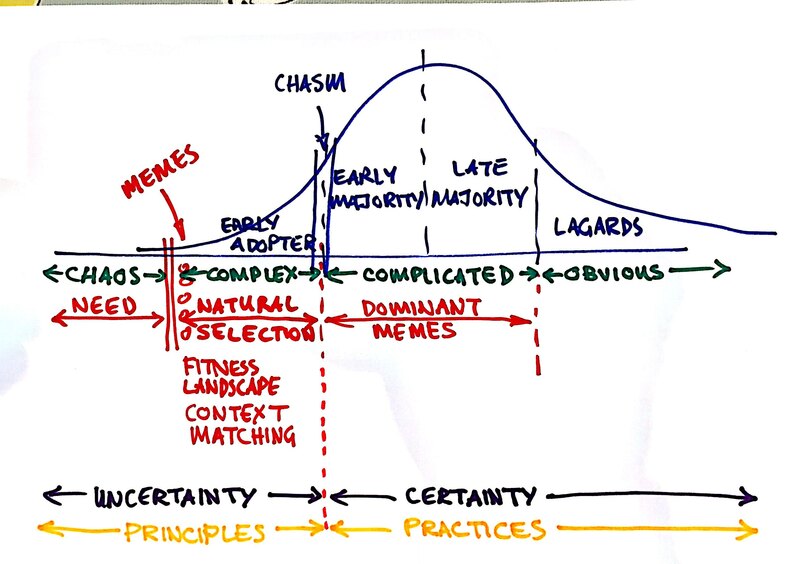 From creation of the meme to exiting the chasm, agents engage in safe to fail experimentation to test multiple hypothesis in order to map the meme to the different fitness landscapes. Mapping to Cynefin made it easy to map to Real Options. An option’s value is only greater than the intrinsic value when there is uncertainty. When there is certainty, there is no value in deferring a commitment. This is where “unless you know why” comes in. If you know why, if you have certainty, then you can commit early. And finally, it is possible to map to principles versus practice. Those operating before the chasm act based on principles. They understand that they may be operating in a fitness landscape where the meme they are using fails. Once the meme has exited the chasm, the users expect that they only need to follow the practices, and the principles become less important. Often the principles are forgotten or ignored and this leads to failure as more obscure fitness landscapes are discovered. This failure corresponds to the cliff in the Cynefin Model. Fundamentally, principles should dominate before the Chasm, and practice dominates after the chasm. This causes real problems for memes that are principle driven like many of the Agile practices. The “Communities of Need” are centred on the creation of memes. 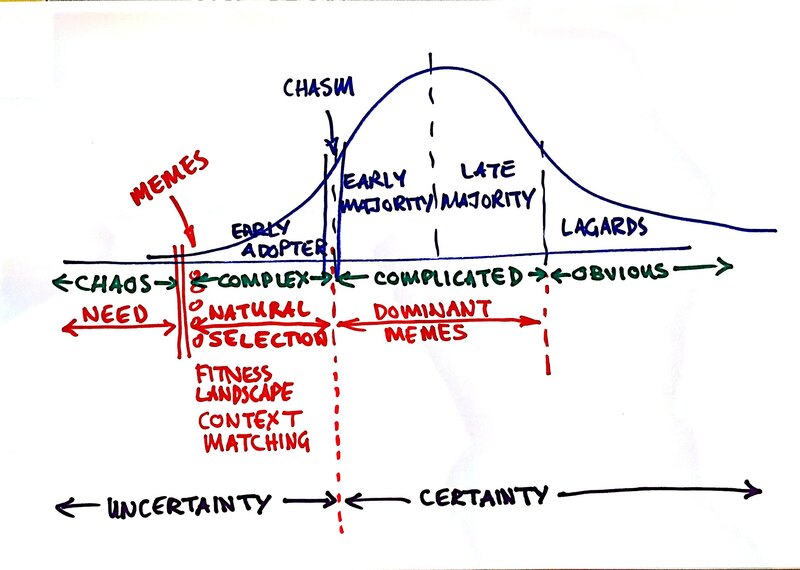 Members of this community operate in the area of “Need” to create a meme and then work with the meme to identify fitness landscapes where it fails, and evolve them accordingly. These communities have problems that need to be solved. They take solutions developed for one context and attempt to implement them in their own context (exaption), and modify (evolve) them as appropriate. The “Communities of Solutions” are centred on the Chasm. Members of this community attempt to extend the number of fitness landscapes that a meme works in and then sell the meme to the early and late majority on the other side of the chasm. Experience Reports dominate, and spark discussion. There is an understanding that Communities of Need grow based on experiences. An experience prompts others to share stories and a “model” is built accordingly. The conferences have a heavy open space element as the participants are often as knowledgeable as the speakers/facilitators. Organised sessions are often workshops ( Gold fish bowls ) to harvest community knowledge. Examples of “Community of Need” conferences include XP Day, Lean Agile Scotland, Agile Lean Europe 20xx, Lean UX NYC. Once a need has been resolved, communities of need may dwindle, or move on to solve another need. A classic example of this is XTC. The needs of the London XTC community have pretty much been met. They know how to write software in small teams, and there are no significant community needs outstanding. As such, those interested in personal development now gravitate towards the software craftsmanship community. Every member of a “Community of Need” is a leader. They are Problem Champions. As such, these communities do not tend to have leaders. If anything the leaders are often servants of the community who support the community, organising events but no one knows who they are. The keynote is famous. More often than not talking about a subject they have no practical experience in. They have either read a book or done a bit of study. Malcolm Gladwell is the ultimate expression of a keynote for a CoS. If they do have any experience, it dates back years in the past. There are normally workshops added onto the conference on subjects near the chasm. The sessions are organised in advance and consists of talks, workshops and “taster” sessions where the attendees learn from the speakers. Attendees want to be told what to do. The Conferences are organised as commercial ventures with the profits generated going to the organisers. Context is not considered relevant. Examples of “Community of Solution” Conferences include Agile20xx, QCon, Goto. These communities have leaders with a clear pecking order. The leader often annoints the next generation. The leaders of a “Community of Solutions” are often not practitioners or even members of the “Community of Need”. Their position is normally due to their relationship with the existing leaders. “Communities of Solution” have leaders and followers. The leaders are the Solution Champions. The Communities of Need in the Agile Community are in a terrible state. Very few members of the Community of Need attend Agile 20xx anymore. There just aren’t enough practitioners around to create a decent corridor conference. Some Agile Practices have crossed the Chasm. Agile has not crossed the Chasm. Scaled Agile certainly has not crossed the Chasm. Team level Agile – This has crossed the Chasm. Safe provides a nice packing of the established Agile Practices. The Agile Release – This is halfway toward the chasm. There are several successful case studies. Portfolio Vision – Agile at this level has not even identified all the needs. There are still several problems to be identified. So some of the Safe practices are across the chasm with the uncertainty resolved. Others have not. You need to hire people from the “Community of Solutions” to train and coach your organisation. That is not enough though. Any company considering an Agile Adoption at Scale should also hire a number of people from a “Community of Need”. The people from the “Community of Need” will help you with the context issues. They will also help you create safe to fail experiments for those problems where there isn’t a known solution. To misquote Dave Snowden “You need Chefs as well as cookery books”. I’ll end there. This is part of the Keynote I’m preparing for Agile Lean Europe 2015. My next post will be to discuss the problems caused by the lack of structure linking these two sets of communities. This entry was posted on Sunday, April 19th, 2015 at 4:06 pm	and posted in Uncategorized. You can follow any responses to this entry through the RSS 2.0 feed. I’ll buy this (while I might think that Programme level Agile is a bit further on than you do). And I’ll note that you seem to be agreeing that SAFe has the right shape at least. And I’ll agree that of the three, the Portfolio level is by far the least well defined and more susceptible to “it’s all necessarily context sensitive” handwaviness. Well no, it’s not unalloyed Team level Agile. But Team level Agile’s attempt at revolution didn’t work. So if we’re looking for those communities of Need & Solutions for Programme & Portfolio, I suspect we’re looking in the Wrong Places in organisations. I think one of the failings of the Agile Community is a lack of proper engagement with practitioners at the program and portfolio level. Sadly a lot of developers are coming up with solutions for needs they do not understand. HI Chris, I’m a little late coming to read this. Some interesting thoughts.